Lois Capps was a Democratic member of the United States House of Representatives, representing the 23rd district of California. 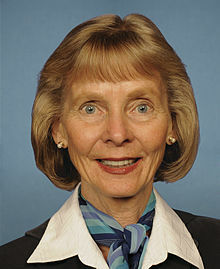 Congresswoman Lois Capps was sworn in as a Freshman Member of the 105th Congress on March 17, 1998, succeeding her late husband, Congressman Walter Capps. She was the Representative of California’s 22nd District from 1998 to 2002. Since January, 2003, Capps has served as the Representative of the 23rd District. Her district includes portions of San Luis Obispo, Santa Barbara, and Ventura Counties. In April 2015, Rep. Lois Capps, D-Santa Barbara, announced early this month that she would not seek re-election after nine terms in Congress. Capps was born in Ladysmith, Wisconsin. After graduating with honors from Pacific Lutheran University in Tacoma, Washington with a Bachelor of Science degree in Nursing, she worked as a nursing instructor in Portland, Oregon. Capps earned a Master of Arts degree in Religion from Yale University while working as Head Nurse at Yale New Haven Hospital. In addition, she earned a Master of Arts degree in Education from the University of California, Santa Barbara and received honorary doctorates from Pacific Lutheran University and Pacific Lutheran Theological Seminary. The daughter of a Lutheran minister, Capps has been an active member of Grace Lutheran Church since 1964. Capps was married to Walter Capps for 37 years. The Council for a Livable World, founded in 1962 by long-time socialist activist and alleged Soviet agent, Leo Szilard, is a non-profit advocacy organization that seeks to "reduce the danger of nuclear weapons and increase national security", primarily through supporting progressive, congressional candidates who support their policies. The Council supported Lois Capps in her successful House of Representatives run as candidate for California. By Richard Flacks for the Santa Barbara County Action Network Action Fund, April 26, 2012. The board of the Santa Barbara County Action Network Action Fund has voted for a number of endorsements in local races to be decided in the June 5 election. The board is particularly proud to endorse Joyce Howerton, candidate for the Board of Supervisors in the Fourth District. The board urges the election of Hannah-Beth Jackson for State Senate. SBCANAF endorses the following candidates for re-election to the county Board of Supervisors: Salud Carbajal for the First District and Doreen Farr for the Third District. The Action Fund endorses Das Williams for re-election to the Assembly and Rep. Lois Capps, D-Santa Barbara, for Congress. The SBCAN Action Fund will be urging its hundreds of supporters to contribute their time, energy and dollars to these campaigns. Lawanda Lyons-Pruitt, on left, accepts the Social Justice Award from Santa Barbara County Action Network during the North County “Looking Forward” Awards Dinner in Santa Maria on June 7, 2015, while dignitaries wait to present their own awards. Capps has been supported by EMILY's List during her campaigning. In 2008 Capps was endorsed by JStreet PAC. In 2012, “JStreetPAC’s proven track record of success speaks to the wellspring of support that exists for candidates who stand up for pro-Israel, pro-peace policies. Candidates like Sherrod Brown, Tammy Baldwin, and Lois Capps who took our endorsement and share our positions did come under attack and still won convincingly,” sad Jeremy Ben-Ami. Lois Capps signed the letter. On Dec. 22, 2009, thirty-three U.S. Representatives wrote to Secretary of State Hillary Clinton, calling on her to request that the Israeli Government end the ban on student travel from Gaza to the West Bank. Lois Capps was one of the signatories of the letter. The entire letter together with a complete list of signatories can be read by clicking here. On Jan. 27, 2010, U.S. Representatives Keith Ellison and Jim McDermott led 52 other members of Congress in signing a letter addressed to President Barack Obama, calling for him to use diplomatic pressure to resolve the blockade affecting Gaza. Lois Capps was one of the signatories of the letter. The entire letter together with a complete list of signatories can be read by clicking here. Members of the Host Committee included Lois Capps. Signatories included Rep. Lois Capps. In 2013 Progressive Democrats of America assigned activists to deliver their material to almost every US Congressman and Senator, Lois Hamilton was assigned as the contact for Rep. Capps. Reps Sam Farr, Loretta Sanchez, and Lois Capps attended the Center for Democracy in the Americas' 7th Anniversary Event July 10, 2013. The Alliance for Retired Americans Political Action Fund endorsed Lois Capps in 2012, 2014. “CAIR is the national forefront of fostering a positive understanding of American Muslims and works tirelessly to foster interfaith understanding through education and dialogue.”- Rep. Lois Capps (D-Calif.) (September 2014). This page was last modified on 9 January 2018, at 16:12.